Hangzhou is a city with a rich history and culture, spanning back over 2000 years. The city first made a name for itself in the sixth century, when the Grand Canal opened up and linked the area to other centers of trade such as Suzhou. The Song dynasty helped to make Hangzhou famous when they moved the imperial family here in the 12th Century. With its inviting views and outstanding scenery, the West Lake soon became popular with numerous artists, poets and painters seeking inspiration in this little bit of “paradise.” Hangzhou has long been a famous tourist attraction. The widely expressed Chinese proverb, “in heaven there is paradise and on earth there are Hangzhou and Suzhou” have helped to make Hangzhou one of the biggest tourist attractions in the entire country. Route: Boarding from Shanghai- Fei Lai Peak -West lake Cruise ( about one and half hour)-Heavenly wind over Wushan Hill-famous Song Dynasty street-back to shanghai. During this tour we will drive with car in this city. Lin Ying Temple and Fei Lai Peak is one of the most prestigious Buddhist monasteries in China. It was built in 326 A.D. at the foot of Ling yin Mountain. Due to war and calamity, it has been destroyed and rebuilt no fewer than 16 times. Fei lai Peak stands very close to the temple with many Buddhist stone carvings of ancient times. West Lake is large freshwater lake, bordered on three sides by hills. Its banks and islands are blanketed with small gardens and temples. It made Hangzhou city a very beautiful place to live in China. As an old Chinese saying declares, “in heaven there is paradise, on earth Suzhou and Hangzhou. The famous western traveler Marco Polo considered it as the most enchanting city in the world at his time. West Lake is the symbol of Hangzhou, which is like a shining pearl inlaid on the vast territory of China. It was originally a lagoon adjoining the Qiantang River. As early as Tang Dynasty (618 – 907 A. D.), work was taking place to control waters of the lake with dykes and locks. The two causeways, the Baidi and the Sudi, split the lake into sections. Dragon Well Tea Plantation is named after a well in the village where according to a legend that a dragon dwelled and ensured that it rained. The well is still there. The area surrounding the well has many buildings and pavilions in it also. There are meandering paths connecting them, and the area is sheltered by large trees and bamboo groves. It is a very lovely place. It is very deep and is still being fed by a natural spring. The well is surrounded by a small marble fence carved in the shape of clouds. Clouds are where dragons are supposed to traditionally dwell. It is amazing! Brewing tea with the dragon well is extremely fragrant! he atmosphere is very wonderful and peaceful. The tea houses, tea pavilions, and the restaurant are beautifully placed amongst bamboo groves and tea trees. The workers all wear traditional style clothing and are very good at doing Gongfu Cha. It looked like a beautiful Chinese garden devoted to tea. So if you have a chance to come to Hangzhou, do not miss the Dragon Well Tea Plantation! 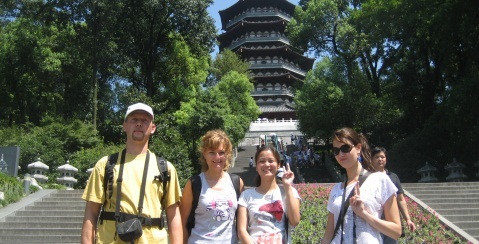 The Six Harmonies Pagoda is one of the most famous attractions in Hangzhou. People who come here can not only enjoy the grandness of the ancient pagoda, but also appreciate the beautiful scenery of Qiantang River. The Six Harmonies Pagoda has an elegant figure and proper proportion. Although it had been fixed for many times, it still keeps the original scene. It is the masterpiece of ancient architecture art in China. So, in 1961, it was listed into the important culture relic protection unit. Also, visitors may enjoy the religious culture near the Six Harmonies Pagoda. The mysterious legends and events must lure you much. Museum of Traditional Chinese Medicine :The Hu Qing Yu Tang Museum of Traditional Chinese Medicines located at the foot of Wushan hill in Hangzhou.It is the only State-level professional one in China.Built on the foundation of a group of old buildings of Hu Qing Yu Tang Traditional Chinese Pharmaceutical Factory.The museum presents to visitors a style of antique architecture besides a treasury of traditional Chinese medical science and technology. The museum,covering more than 4000 square meters of building area,consists of five parts:an exhibition hall,a hall of medicine preparation by manual labour,a health care clinic,a sales department and a restaurant of medicinal diets. National Silk Museum Hangzhou a large number of ancient silk artifacts, as well as models and photographs. Articles from the neolithic period include certain items from more than 4,700 years and even a dyed piece of silk woven fabric from more than 5,600 years ago. Woven silk pieces excavated from the Jiang ling Ma shan Chu Tomb in Hu bei Province show the high level of weaving technology during the Warring States period. By the Han period, the development of Chinese silk weaving had reached its first peak. The fabric excavated from the Tomb at Ma wang dui that is exhibited here is extraordinary. It lay underground for more than 2,000 years and yet is still as lustrous and beautiful today as it was when it was buried. Heavenly wind over Wushan Hill: is a major town center in Hangzhou. The view from the top is excellent on a clear day, and there are also trails around the hills from behind the pagoda. The pagoda itself has been modernized with an elevator and nice open-air tea house at the top, but the original bell is still intact and in use. This area also features easy access to He fang street shopping street at the base of the hill, full of small pedestrian streets and shopping stalls. It is also extremely close to the West Lake itself. Heavenly Wind of Wu Shan Hill is one of the ‘Ten New sights of the West Lake’. The Wu Shan Hill protrudes into the city of Hangzhou, giving rise to a scenic attraction marked for its graceful sights, exotic rocks, mysterious caves, ancient wells and trees and quite a few sites of historical interest. Lei Feng Tower:As one of the ten famous old sights featuring West Lake in Hangzhou, it was first built in 975 but damaged by lightning at a time unknown. It had once been rebuilt into an octagonal five-storied pavilion in early Southern Song (1127-1279).In 1924, the inner structure of Lei Feng Tower collapsed with ruins leaving down only the fame “Lei Feng at Sunset”. In October 1999, a special committee was organized to see academic papers and correlated materials for making a study into history and reconstruction of the tower in the past two decades were garnered. Following history, experts’ consultation and Qinghua University’s blueprint, a steel structure was chosen to build new similar tower over old ruins at the original site of Lei Feng Tower. The new one is designed to be a five-storied pavilion inlaid with brick and upturned eaves. Hangzhou’s inordinate beauty has been an inspiration to artists for centuries – Lin Hejiang, a tenth century poet is famous for having lived as a recluse on Solitary island for twenty years. And indeed, two more of China’s most influential poets, Bai Juyi and Su Dongpo, served as governors here at that time. During the Qing dynasty (1644-1911) the city became known as a popular tourist destination, much frequented by such notables as the Emperor Kangxi and Emperor Qianlong, who built a palace and important library here. Similarly, during the late twentieth century, Mao Ze Dong was smitten by its charm. He snatched moments from his hectic political life to write “Ode to the Mume Blossom”, which by its very title recalls Lin Heijiang’s “To the Mume Blossom”, written a thousand years earlier. Chinese products, such as silk and ceramics, were traded for wood, pearls and handicrafts from Japan; ginseng and medicinal herbs from Korea; and spices, ivory and jewels from Southeast Asia and the Middle East. As a result, by the end of the thirteenth century, the wealthy population had swelled from half a million to nearly two million. The city became known for its sybaritic life: one resident had the floor of his house covered with tiles inlaid with silver; pets were dyed pink with balsam leaves and Hangzhou’s West Lake became the focus of a thirteenth century pleasure-ground with splendid boats, restaurants and entertainers. Seven hundred years later, Hangzhou’s West Lake continues to draw foreign tourists and local Chinese to its beautiful shores.